Build a tasty ice cream empire! 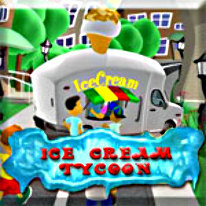 Become a millionaire mogul in Ice Cream Tycoon! Starting out with just a pushcart and a bell, select your ice cream and purchase a cart full of tasty ice cream. Then pick a likely neighborhood, looking to maximize your profits. You’ll need to make the right decisions about which flavors to stock and which neighborhoods to work in. Of course, you’ll need to watch out for the tax man, and local bandits that all want a piece of your ice cream pie! So get out there and make a million bucks and more in the ice cream business before your competition makes off with all the cash!